I recently entered this Ritz cracker recipe contest recently sponsored by Guy Fieri, which caused me to look through a bunch of his recipes for inspiration. I really love his recipes because they are always banger and packed with flavors. If you are not sure who Guy is, he is the punk-rock-looking, spiked hair guy from Diners, Dives, & Drive-Ins (as well as like ten other TV shows I feel like!). This recipe is amazing because if combines the delicious flavors of chorizo and shrimp along with lots of cheese! I am a big fan of roasting peppers/chiles. It gives them an entirely different flavor. Roasted peppers and chiles also make the perfect dish for holding your delicious recipe ideas. 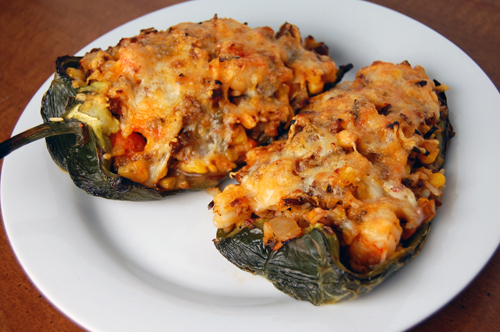 I tweaked Guy’s original recipe a bit, but of all the stuffed pepper recipes I have made, I can safely say this one is my favorite. I highly recommend that you try it as well!